The weird thing for me is that I can never plan or combine large or small paintings, often it all depend on what is working at the moment. I guess it has to do with (unlike 7-8 years ago) that I paint with instinct, expression, not planning too much. At the moment large works best, with small interruptions where I get some inspiration from details that I can take to a smaller canvas. 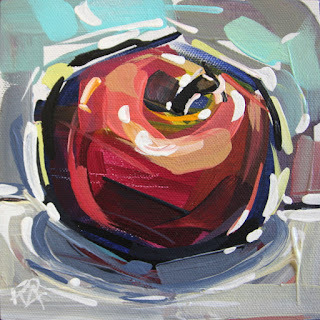 Apples was one thing that worked very well on a few of my "Flower Exploration" paintings, and this one is the result of it.